I saw some roses at a teller’s station at my bank today, and found out that they were a gift for a teller for her second anniversary. I wished her a happy one. 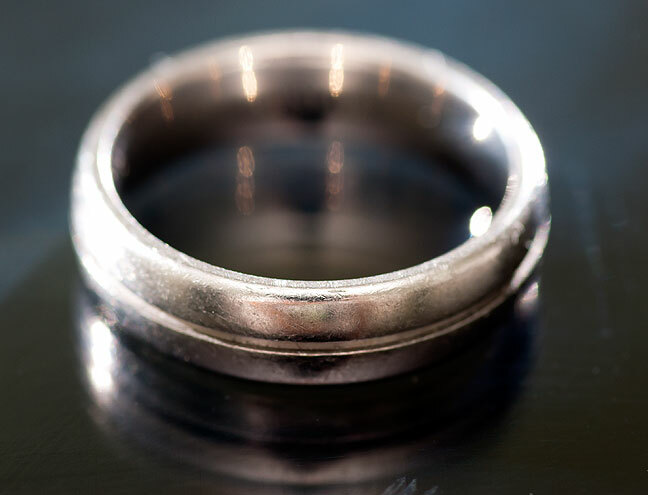 My titanium wedding ring; strong, lightweight, elegant. It is the most important thing I put on every day. We click ours together, like superheroes, before tackling difficult tasks. I was thinking of couples like you, Richard, while writing the Velcro poem. Not that you are imperfect, but just that you have managed to stick together like Velcro. And I love the clinking together of rings, Ms. Nicole. Very powerful symbolism there. Great story, great comeback. I am equally proud of mine. Ugh. I’ve always disliked the “ball and chain” and “handcuff” metaphors for marriage. So many things wrong with the comparison. I hadn’t thought of it, but I suppose that’s true for me too. That’s awesome, Nicole. Love it.